Ugandan-born social entrepreneur Derreck Kayongo says that “when you’re trying to do something big, you have to start small”. It is fitting then that Kayongo’s Global Soap Project started with three small bars of soap in a hotel room in Philadelphia in the early ‘90s. Having recently arrived in the US, Kayongo was amazed to see that on the morning after his first night’s accommodation, the barely used soap bars had been replaced with brand new ones. Afraid that he was going to be charged for all this soap (two of which he had saved), he went to see the concierge who explained that it was just hotel policy to change the soap every day. Kayongo fled Idi Amin’s Uganda some years previously, where he used to see “dead bodies on the side of the road” on his way home from school. Living as a refugee in Kenya before coming to the US, Kayongo was lucky enough to escape the overcrowded refugee camps where many of his friends ended up. Here, soap was either in scarce supply or beyond the financial means of many of the refugees, and issues of poor hygiene contributed to epidemic levels of diseases such as diarrhoea. Still today, it is estimated that two million children die annually from similarly preventable diseases. Kayongo says that he found it hard to understand how in a world where so many people live without basic resources, “such a valuable resource was just being thrown in the bin. I just couldn’t believe it”. Motivated by the need to address this juxtaposition, Kayongo embarked on further research. He discovered that there were a little over 4.6 million hotel rooms in the US and that 2.6 million bars of soap were being thrown away on a daily basis, amounting to approximately 800 million bars annually. Global Soap Project was born in 2009. With a full-time staff of just eight members (including his wife) and a team of around 30 faithful volunteers, Kayongo collects unwanted soap from over 300 hotels in the US, cleans it and then recycles it. The new soap is then cut into bars and sent to refugee camps and impoverished regions in countries all over the world, including Kenya, Haiti and Swaziland. Global Soap Project has also “joined hands” with various NGOs such as the Red Cross and Unicef who have “boots on the ground” and can distribute the soap, free of charge, within these countries. Kayongo’s tireless campaigning and remarkable personal journey have already gathered considerable support and recognition for the project which is only two years old. His efforts culminated in Kayongo’s nomination onto the 2011 CNN Heroes list, which showcases everyday people changing the world. Archbishop Desmond Tutu has also publicly endorsed the project in recent months. But Kayongo and his team are not ready to rest on their laurels just yet. Having already distributed over 100,000 bars of soap worldwide, Kayongo wants to take that number to a million a year by next year. To put these numbers into perspective, Kayongo says that this would be enough to supply every single refugee in Kenya with soap. 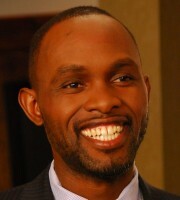 The demand is certainly there – “Haiti still needs four million bars of soap right now!”, says Kayongo. Whilst Global Soap Project is already supplying soap all over the world, the goal is to extend their reach further still. Kayongo’s next step is to make the actual processing of the soap “a global thing” and to run depots within the continents or even the countries where soap is most needed. Within Africa, Kayongo says that he sees South Africa as his prime location due to its more developed infrastructure and economy, its affluent private sector, as well as its relative political stability. But it is quickly clear that both fate and a sense of duty are only small parts of the equation. Born into a family of entrepreneurs, Kayongo’s work has become his passion, “and when you’re doing something you love,” he says, “It’s not work”. Looking forward, it seems South Africa could play a pivotal role in extending what Kayongo calls “the hand of love” ever further into the continent. This entry was posted in Business, Health, Video and tagged Africa, Derreck Kayongo, entrepreneurs, Global Soap Project, international award, skills development. Bookmark the permalink.